On the market, you can sell your own goods as well as buy goods produced by other players. All goods that you store in your warehouse may be put out for sale on the market. 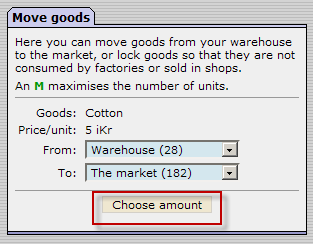 This is done by entering your warehouse, clicking the goods you wish to sell, and then deciding how many of these goods you want to move to the market. It takes 60 to 120 minutes before the goods appear on the market. This is to prevent cheating. When goods are moved to the market, they no longer occupy space in your warehouse. 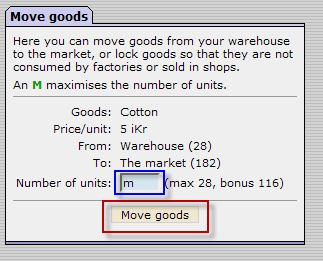 When selling to the market, your goods are queued along with goods of the same type sold by other players. Goods that are queued ahead of yours will be sold first. 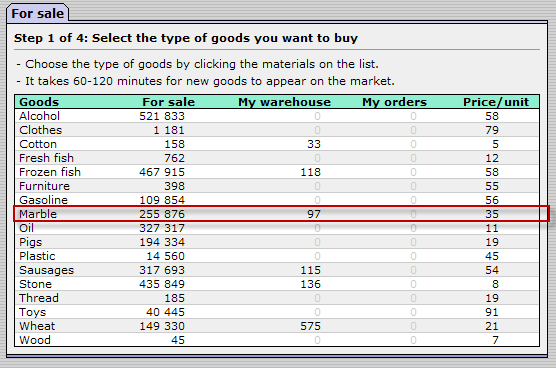 You can check what queue position your goods hold by clicking "My goods" (under Market). As queued goods are sold, your goods will move forward in the queue, and eventually be paid for and transported to another player's warehouse (happens instantly after the transaction is complete). 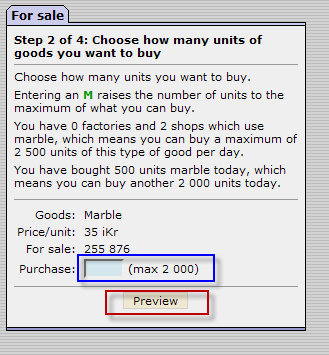 You cannot yourself decide the price of the goods you sell - all goods are sold using the market price calculated by the game (can be viewed on the "Materials" page). When selling wares, 10% of the money you gain goes to the stockpile. Every Sunday, the stockpile money is divided among the shareholders in your company (except when you hold your shares yourself). More on shares and dividends in the "Stocks" help file. The market price for sausage is 20 iKr/unit. You have placed 100 units of sausage on the market, which someone decides to purchase. 20 iKr X 100 units = 2 000 iKr. How much will be allocated to your stockpile. 10% of 2 000 iKr. 0.1 x 2 000 = 200 iKr. What will my income be? 2 000 iKr - 200 iKr = 1 800 iKr. To purchase goods, click the "For sale" link to see what is available on the market. The price of each type of goods will also be displayed. Click on the type of goods you want to purchase, and a box will appear where you must insert the number of goods you want to buy. Confirm the purchase, and an order for the goods will be made. Waiting orders are processed every ten minutes. At this time, you will receive your goods unless someone has put in an order for the same goods (and there are not enough goods on the market to accommodate both orders). If you do not receive your goods, or only receive part of the goods you ordered, money spent on goods not received are refunded. Please note a change made in 2008 to purchases of goods: A player can place only one order per 60 seconds for a particular type of good. For goods that are in high demand, a player may only purchase 25% of the goods on the market at a time (minimum 250). This is to prevent a single player from purchasing all goods the instant they appear on the market. After the goods have showed for sale past a 30 minute waiting period, you can purchase the whole amount for sale if desired. Here, you may view goods you have put for sale on the market, and what position they currently hold in the market queue. During the time it takes for your goods to appear on the market, your goods may jump back and forth in the market queue. This is because it varies how long it takes for goods to arrive on the market. For instance, if your goods need 100 minutes, another player's goods may be put for sale after yours, but only need 80 minutes, thus appearing ahead of your goods in the queue. This is to prevent cheating by making the market more unpredictable. As long as your goods have not yet been sold on the market, you can withdraw them, bringing them back to your warehouse. To do this, simply click on your goods, choose how many you want to withdraw and confirm. Market bonuses can be gained both when buying and selling goods. The sales bonus is an incentive for a players to take goods they produced and sell them on the market. Players can earn 1 iKr company value for each unit of a good sold on the market that qualifies for the bonus. You can see how much bonus you are eligible for by clicking on the "Bonuses" link under "The market". Yesterday you produced 300 units of wheat. 100 units were used in your mills, and you sold 50 units to the bank. What is today's market bonus for wheat? 300 - 100 - 50 = 150 units. This means you are eligible for a market bonus on up to 150 units of wheat sold on the market today. The wheat must have been produced by you -- purchasing wheat from the market will invalidate your market bonus. The market bonus is only valid for the day. It is earned when goods are actually sold (not when they are placed on the market). 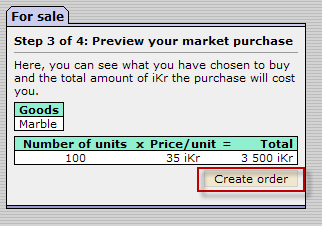 You can click on your market sales transactions to see the detail to determine if you earned a market bonus. This transaction shows 1000 units of wood sold for a net of 4500 iKr. The Company Value you earn from the cash is 4500 / 20 = 225. In this transaction, the player also earned market bonus for all 1000 units of wood, for an additional 1000 iKr of Company Value. His total gain in Company Value from this transaction is 225 + 1000 = 1225. When buying goods to refine into more valuable products, a part of the money spent on the goods will be returned to you. For instance, if you buy pigs on the market and use it to produce sausages, you will be eligible for such a refund. You may, however, only receive a total of 2 500 iKr of refunds during each round (the entire 70 days that a round lasts). Purchase bonus is awarded at midnight the same day that goods bought on the market were consumed by a factory. It refunds 1/5 of what you paid for the goods you refine. You receive the bonus based on how many of the purchased goods were used in production during the 24 hour game day. Buying goods from the market and selling the same goods in your shops does not entitle you to this market bonus. This page was last modified on 17 May 2014, at 22:27. This page has been accessed 42,167 times.